Because it is available in most supermarkets and has scored highly in past tastings, Hershey's Special Dark is the chocolate of choice in this recipe. Other bittersweet chocolates will work, but because amounts of sugar and cocoa butter differ from brand to brand, they will produce cakes with slightly different textures and flavors. When crumbling the brown sugar to remove lumps, make sure that your fingers are clean and grease-free; any residual fat from butter or chocolate might hinder the whipping of the whites. 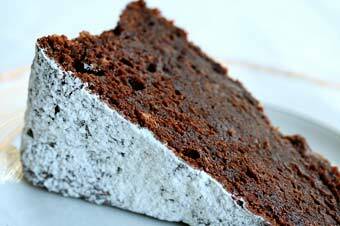 If you like, dust the cake with confectioners' sugar just before serving or top slices with a dollop of lightly sweetened whipped cream. 1. Adjust oven rack to lower-middle position and heat oven to 325 degrees. Butter sides of 9-inch springform pan; flour sides and tap out excess. Line bottom of pan with parchment or waxed paper round. Wrap bottom and sides of pan with large sheet of foil. 2. Melt 12 tablespoons butter and chocolates in large bowl over large saucepan containing about 2 quarts barely simmering water, stirring occasionally, until chocolate mixture is smooth. Cool mixture slightly, then whisk in vanilla and egg yolks. Set chocolate mixture aside, reserving hot water, covered, in saucepan. 3. In clean bowl of standing mixer fitted with whisk attachment, beat egg whites and salt at medium speed until frothy, about 30 seconds; add half of crumbled brown sugar, beat at high speed until combined, about 30 seconds, then add remaining brown sugar and continue to beat at high speed until soft peaks form when whisk is lifted, about 2 minutes longer. Using whisk, stir about one-third of beaten egg whites into chocolate mixture to lighten it, then fold in remaining egg whites in 2 additions using whisk. Gently scrape batter into prepared springform pan, set springform pan in large roasting pan, then pour hot water from saucepan to depth of 1 inch. Carefully slide roasting pan into oven; bake until cake has risen, is firm around edges, center has just set, and instant-read thermometer inserted into center registers about 170 degrees, 45 to 55 minutes. 5. To unmold cake, remove sides of pan. Slide thin metal spatula between cake and pan bottom to loosen, then invert cake onto large plate, peel off parchment, and re-invert onto serving platter. To serve, use sharp, thin-bladed knife, dipping knife in pitcher of hot water and wiping blade before each cut.